This disc is exceptional value, both artistically and financially. At mid-price and just one CD, a marvellous performance of a major classic is available for just a fraction of the cost of its competitors, who take two discs. 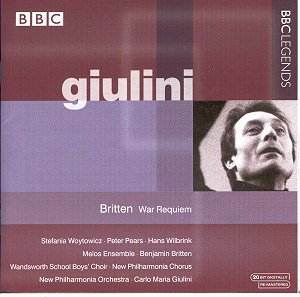 Giulini admired Britten and made a splendid studio recording around this time of the Purcell Variations and the Four Sea Interludes from Peter Grimes. His understanding of the larger issues of the War Requiem is never in question, and he has a first class team of soloists and an orchestra and chorus at the top of their form. The recorded sound is ambient and there is a real sense of occasion. Only occasionally, and never worryingly, do audience noises intrude, while the balancing of the full orchestra and chorus against the chamber forces feels entirely natural. For this is one of the few works which suits the Royal Albert Hall. Full texts and translations are offered to accompany the disc, and there is a remarkably good essay by Philip Reed. If anything this performance is even finer than Britten's own on Decca; Peter Pears, for example, sings with a concentration that is the mark of a great artist on a great occasion. The other soloists are artists of distinction, although hardly household names. The Polish soprano Stefania Woytowicz performed the work often, and her style is ideal for the part which Britten conceived for Galina Vishnevskaya. Hans Wilbrink too is excellent, and while his interpretation is not quite as subtle as that of Dietrich Fischer-Dieskau (with Britten himself on Decca), his voice has a remarkable richness and beauty that adds something significant of its own. Above all this is Giulini's performance, however. He was one of the major conductors of the 20th century, and this recording adds significantly to our awareness of his stature.